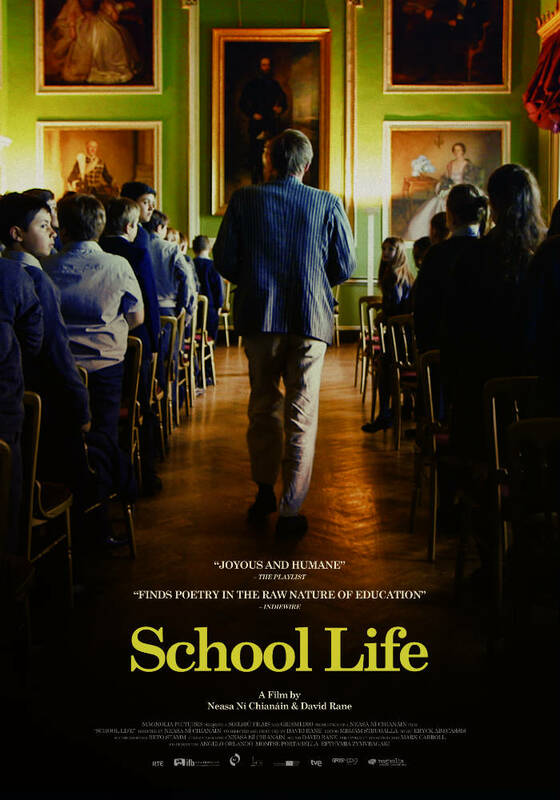 This documentary presents a low-key, highly evocative time capsule of life inside Headfort School, the last boarding school facility for primary schoolers in Ireland. Amanda and John Leyden stand in front of Headfort School (located in Kells, Ireland), a school where the two of them taught for 40 years, watching the students—boys and girls, ages 7 to 13, walking towards the main building—an impressive Georgian-era mansion—catching up with each other after summer break. The noise of the kids’ chatter is deafening. Amanda, an elderly British woman, wearing a thick sweater and sensible shoes, can’t stop smiling as she watches the flood of children pass her, and whispers to herself, “I love them!” This spontaneous moment comes early in the documentary School Life co-directed by Neasa Ní Chianáin and David Rane, and it is the kernel of what this film is about. It is a celebration of these two eccentric and devoted teachers (and, by extension, teachers everywhere). We see them at work, we see them at rest, we see them kneeling by an open window smoking, wondering what they would ever do with themselves if they weren’t doing this? Headfort is not the harrowing world of George Orwell’s Such Were the Joys (his essay about British boarding school life, one of the most painful personal essays ever written). Headfort is a paradise by comparison. The children are given quite a bit of freedom to roam. They climb high into trees, with seemingly no adults around. They build forts in the forest. The classes are small, 12-15 students, so lots of time for group discussions, even about some controversial subjects. Amanda teaches English, and squeals with excitement about reading “The Famous Five” with her class. It was one of her favourites. The students are encouraged to express themselves. Because there are no to-the-camera interviews in School Life, no confessionals, no pie-charts explaining the school’s history or philosophy, the submergence into the school’s atmosphere is total. We are on our own. I don’t think the name “Headfort” even comes up until some ways in. The documentary is a rambunctious collage of a self-contained self-sustaining world, with its own rules of play and concerns. Children clatter down the stairs wearing cleats, bursting out onto the lawn for a rugby match. The kids climb into their bunk-beds at night for quiet reading time. There’s a sort of playroom workspace in one of the out-buildings, the walls covered in murals painted by the kids. It is here that John holds extremely eccentric band practices. He is in a quest to find a drummer. ‘Can anyone drum in this school?,’ he despairs. Someone has painted “JIMI HENDRIX” in bright purple on the wall. Headfort, at times, feels like an Irish School of Rock. There’s some unevenness in the structure because of its resistance to zooming in too closely on this or that individual (outside of the Leydens, that is, and even with them, we never learn where they came from, their backgrounds. We only know them from what we see them do.) The score, by Eryck Abecassis, is a bit too insistent and driving for a work as free-form as this. It’s top-heavy. What we get in the film, naturally, is the rhythms of life over the course of a year at the school, the seasons changing, the fog rolling across the grounds, or the snow driving against the main building. It’s school as microcosm, an entire universe operating at full capacity. Both John and Amanda are naturally humorous people (the film is often very funny), and they manage to be totally supportive while at the same time dry and witty wisecrackers. They care but they don’t coddle. Up until very recently, the film was called In loco parentis—a much more evocative title than the bland School Life ‘In loco parentis’ means ‘in the place of a parent’ which speaks directly to the film’s theme, its reason for being. John and Amanda are that. It is their life’s work. Teaching is not a job. It is a calling. Source: https://www.rogerebert.com/reviews/school-life-2017 Sheila O’Malley 8/9/2017 edited extracts / accessed 14/3/18.